The entire Tianjin First Central Hospital then consisted of an emergency ward, an outpatient center, and the transplant building. By 2004, while the Oriental Organ building was under construction, in order to accommodate demand, Shen’s transplant empire expanded to five branches scattered across Tianjin, Beijing, and Shandong Province. In their official materials, the group claimed to perform the highest number of liver transplants in the world, and the highest number of kidney transplants in China. The Beijing branch was located in the General Hospital of the People’s Armed Police, the Communist Party’s one-million strong paramilitary force, where Shen Zhongyang served as director of the transplant department. If one transplant center in China had to be chosen for its notoriety, it would probably be the Orient. The facility became a major headache for Chinese authorities, Western apologists, and the official story behind China’s transplant industry. “I would speak to a college audience and ask anyone who had any doubts to visit the website on their smartphones,” he said in an interview with Epoch Times shortly after the site was shut down in June 2014. It was precisely this center that inspired an exasperated letter in early 2014 from the normally deferential international transplantation establishment, rebuking China for flouting recent promises made in Hangzhou to no longer use organs from executed prisoners. It was a high-profile operation targeting wealthy customers with a premium, very rare product: fresh human organs available at a rapid turnaround, no questions asked. That a center so large and sophisticated would be built, staffed, equipped, and operated at high capacity for nearly a decade, when China had practically no voluntary donations, has chilling implications, researchers say. “It means there’s an absolute conviction that you’re going to find donors to supply those organs,” said Maria Fiatarone Singh, a professor of health medicine at the University of Sydney, in a telephone interview. “In the context of no voluntary donation system, it implies a complete belief that this unethical supply will be huge and continuous, and that there’s a huge profit to make from it.” Singh is a board member ofDoctors Against Forced Organ Harvesting, a medical advocacy group that raises awareness about transplant abuse in China. But how many transplants did Tianjin First actually conduct? It is extremely difficult to get an accurate handle on the actual number of organ transplants conducted in China over the years, either in aggregate, or even at a single hospital. In a closed society, information of this sort is highly politically sensitive. China did not even have a national organ transplantation system until recently. It was a Wild West of hospitals competing for business, doing deals with organ brokers, and getting their hands on human supply however they could. Statistical integrity, or any kind of reliable statistics at all, are the least of the victims. In the United States, finding out the number of organ transplants that take place is simple. The Organ Procurement and Transplantation Network, affiliated with the U.S. Department of Health and Human Services, maintains a database that can be queried by dozens of criteria. The total number of transplants performed in the United States from January to September in 2015, for example, was 23,134. Other datasets provide specific hospital information. The Scientific Registry of Transplant Recipients is able to spit out a report showing detailed transplant information at any given transplant center. The most active in New York state, for example, is the NY Presbyterian Hospital/Columbia Univ. Medical Center. A report with data current as of April 2015 shows that it performed 110 liver transplants in 2013 and 142 in 2014. The 60 page report provides an abundance of information about those on the waiting list, donor types, transplant rates, and more. Nothing like this information is available on Chinese hospitals—and for good reason: it’s a state secret. Dr. Huang Jiefu, the Chinese official who interfaces with the rest of the world on organ transplantation policy, was remarkably frank about why numbers are so hard to pin down, in a rare interview with Chinese journalists last year. The interview was part of an intense run of publicity as Huang sought to get out the message (later debunked) that China was no longer using organs from executed prisoners. But numbers inevitably seem to trickle out from the holes in even the Chinese Communist Party’s formidable propaganda machine. In the case of Tianjin First Central Hospital, there are several ways of getting them. While the procedure may have a certain monotony about it, let us consider each in turn. The first datapoint is simply a graph from a now defunct but archived page belonging to the Orient Organ Transplant Center, showing the cumulative liver transplants from 1998 to 2004. The yearly numbers grow almost geometrically: 9, 24, 78, 129, 272, 289, and 800. These figures, however, are contradicted by figures in other official sources. The same page advertises the waiting time for a liver transplant as two weeks—unheard of in countries with voluntary donation systems. Livers are a useful organ for calculating how many executions must have been carried out for transplants, given that they are a vital organ, and a transplantation of a full liver requires a death. Given that executions in China have traditionally been the sole source of transplant organs—whether that has changed is another matter—the question of number becomes significant. The problem with the graph is that it stops at 2004. A graph from the website of the Orient Organ Transplant Center, the transplant wing of the Tianjin First Central Hospital. Another method is to simply look at media reports that provide numbers. In this case, beginning in 2000, the number is 78—same as above. The source is a puff piece about Shen Zhongyang in Science and Technology Daily titled “He brought liver transplant technique to the pinnacle of world medicine.” A later source in 2000 gives a cumulative total of 100. In 2001 there is no cumulative figure, but the annual total is 109 liver and 80 kidney transplants, the sources being a Chinese medical encyclopedia and news reports. In 2002 there is no annual figure, but the cumulative is 300, according to a profile of Shen Zhongyang. In 2003 the cumulative total in Tianjin is 645 (though up to 400 other transplants were performed by the Tianjin First team in other hospitals around China, according to an official news report) and the annual 253. This is when a budget is approved at the end of the year for the construction of the 17-story Oriental Organ Transplant Center. In 2004, no specific yearly total was published—but the cumulative total stood at 1,000, according to a report on Medical Education Net, a large Chinese online medical encyclopedia. In 2006, 655 transplants were recorded, according to an official profile of Shen and a medical paper he authored. In that paper, he said that his center had surpassed the world record of liver transplants maintained by the University of Pittsburgh for 10 years. Tianjin’s Orient Organ Transplant Center officially opened on Sept. 1, 2006. It remains unclear why, right when the numbers would be expected to jump, annual data dries up. Incidentally—or not—in March of 2006 allegations began emerging that Falun Gong prisoners were the major source of China’s booming organ trade. Chinese officials dismissed the reports as nefarious propaganda, though never seriously refuted either their argument or inference. In all available sources, only two numbers appear post-2006, both from the same source: a glowing profile of Shen Zhongyang by the Tianjin propaganda authorities. The official profile of Shen Zhongyang is published on ttwj.gov.cn. The website is run by the Office of the Tianjin Municipal Government Human Resources Leading Small Group, and serves as the mouthpiece for the Tianjin leadership. “The Tianjin Party Committee and government pays a great deal of attention to human resource work,” theAbout Us section on the website notes. The profile discusses the incredible success of Shen Zhongyang, his enterprising spirit helping the construction of the Chinese transplant industry, and provides a few transplant numbers. The early figures are roughly the same as those above, and while after 2006 no precise numbers are given, the profile declares that “for the next two years it became the foremost liver transplant center by volume, and made the Orient Transplant Center the largest scale transplant center in Asia.” It adds that as of the end of 2013, the Center had performed the most surgeries in China for 16 years straight. Some of its techniques had become the “most advanced” in the world. And, crucially, it provides two more numbers: A cumulative total of 5,000 liver transplants in 2010, and a cumulative total of “nearly 10,000” by the end of 2014, supposedly a quarter of the national total. Those numbers are already disturbingly high, and extremely difficult to fit into the official narrative of executed-prisoners-as-organ-source. It is still unclear why annual numbers ceased after the major new transplant center was built, which calls into question whether the neat, rounded numbers can be trusted. The real number of transplants, according to other records, may have in fact been much, much higher. There are three indicators of this probability: anecdotes of a booming business in providing organs to Korean tourists; significant transplant figures by Shen Zhongyang’s colleagues; and a guerrilla analysis derived from Tianjin First Central’s own renovation records, dredged from an obscure Chinese database. Korean patients began streaming into China, and in particular Tianjin—just a 90 minute flight from Seoul—in 2002, according to Li Lianjin, head nurse at Tianjin First Central Hospital. The hospital had provided organ transplants to over 500 Korean patients between 2002 and 2006, Li said. All this activity took place before the Oriental Organ Transplant Center came online in September of 2006. So doctors improvised. One third of their original 12-story building was converted to house transplant patients; the 8th floor of another hospital (the International Cardiovascular Hospital) was also used for Korean recipients; and the 24th and 25th floors of a nearby hotel were also reserved for those waiting. Two nurses were assigned to that location. “Even so, we’re still short of beds,” Li said. The Tianjin First Central Hospital. Tianjin was an agreeable destination for Korean organ tourists because in Korea they could typically only receive partial liver transplants from living donors. But in China, they could get whole livers, “and the donor livers are of excellent quality,” the report says. Procedures were also expedited: foreign patients would simply fax their medical records then fly in. Waiting times were extremely short by international standards. “Originally, patients had to wait about a week. But now, because more and more people have joined the queue, the waiting times are longer. The longest time now is a bit over three months,” the report says. Three months is still a remarkably short waiting time to guarantee a liver. The Chosun Ilbo, a large Korean daily newspaper, reported that Tianjin First Central performed 44 liver transplants in one week in December 2004, including 24 in a day (including kidney transplants), according to the Phoenix report. Patients from other countries were also there: from Japan, Malaysia, Egypt, Pakistan, India, Saudi Arabia, Oman, Hong Kong, Macau, and Taiwan. The café in the ward on the fourth floor became an “international club,” where patients of different ethnicities met to exchange their experiences, reported Chosun Ilbo. No numbers are given in the report, but it at least confirms that the staff at Tianjin First had been extremely busy leading up to the completion of the new transplant building. The Oriental Organ Transplant Center has 110 doctors participating in liver and kidney transplants, among whom 46 are chief surgeons and physicians, and 13 attending physicians, according to the World Organization to Investigate the Persecution of Falun Gong, a network of researchers who performed the monumental task of cataloging the staffof hundreds of hospitals around China. Media reports, speeches by a select number of Shen Zhongyang’s colleagues, as well as information on the hospital’s own website and other records, indicate many of them had each completed a large number of transplants themselves. For instance, by 2011, Vice President of the hospital Zhu Zhijun had completed at least 1,400 liver transplants, 100 of which were partial liver donations from living relatives, according to his profile on the website “We Doctors Group,” a directory for Chinese doctors. As of July 2006, associate chief surgeon Pan Cheng had personally performed over 1,000 liver transplants, and 1,600 liver graft procurements. Chief surgeon Gao Wei completed over 800 liver transplants after ten years of practice, according to his undated profile on “Good Doctors Online,” another well-known Chinese doctors database. Associate chief surgeon Song Wenli from the renal transplant department performed around 2,000 kidney transplants; associate chief surgeon Mo Chunbo over 1,500, both according to undated profiles on the same site. Some of those operations did not result in the killing of a donor—hundreds of donations were from living relatives, for instance (if they were indeed from relatives)—but many of them must have. If the average total transplant volume of these surgeons was simply extrapolated to the rest of the staff—not necessarily a reliable methodology—the total transplant volume, as of 2014, would immediately be several times greater than the official number of 10,000. It is clear from just a few doctor profiles, however, that the figures are beginning to approach the totals announced by the hospital. Of course, the doctors whose profiles are available may simply be outliers. Or they may be inflating their records, or have participated in joint operations—all distinct possibilities. In any case, even given drastic discounts, the surgeons’ own organ numbers seem to far outstrip the official ones. But building records indicate that the transplant volume could be much higher than even that. Given that the municipal government spent about $20 million (130 million yuan) in building the Orient Organ Transplant Center, common sense dictates that there would be an intended use for it. But this is China. Huge amounts of infrastructure spending is wasteful, often used to prop up local economic figures rather than create productive businesses. Thus, the mere fact of construction and renovation cannot tell us everything. There is compelling evidence, however, that the new building was put into immediate and extensive use. This comes from the hospital’s own building and renovation records in the China Construction and Remodeling Database, a public resource maintained by a variety of officially-affiliated agencies, providing details of construction and renovation work from across China. These documents show what seems to have been deliberately hidden in every other available Chinese source: that it was full speed ahead at Tianjin First after the new transplant center came online in 2006. An aerial shot of the Tianjin First Central Hospital. The key evidence is a 22 page PDF file, available for download after creating a username and password on the site, which discusses the further renovations to the new building, completed in 2008. The renovation described in the document is primarily to the main building, the outpatient building, and the emergency ward (the transplant building is left untouched), and included the addition of insulation to the facade “in order to save energy and increase the comfort of patients.” Another floor would be also be added to the outpatient building, taking it from three to four stories. The total number of beds devoted to transplantation at Tianjin First during this period was 500, at the Oriental Organ Transplant Center. Total bed count at the hospital sat at 1,226, with 726 originally available. Total floor space was 46,558 square meters, the document states. Thus, according to these documents, 450 beds were used for transplants, whether livers, kidneys, or otherorgans. According to Tianjin’s advertising materials for foreign patients, the total time an organ tourist would expect to stay in the hospital could be between one and two months, depending on the wait time for an organ, and how long it takes to convalesce. If an average patient stay was 30 days per transplant, then 5,400 transplants per year would have taken place at the Oriental Organ Transplant Center from late 2006 until the end of 2008. If the stay was two months, the total would be 2,700. It is impossible to know the actual average length of stay at Tianjin First, but transplant surgeons who reviewed this report considered that either of those scenarios would be plausible. But was this high level of utilization a mere blip in the two years following the opening of the new center? No, according to other renovation reports. It soon became the norm. The next available datapoint on transplant-relevant bed usage rates at Tianjin First comes from a profile of the hospital on Enorth Netnews, the official Tianjin government mouthpiece, on June 25, 2014. 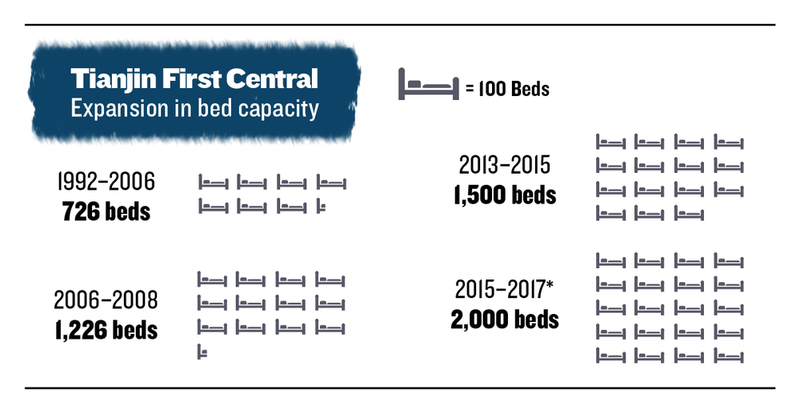 By 2013 it had also added 300 beds, bringing its total number now to 1,500. The hospital had also adjusted the number of beds allocated to different departments, including the organ transplant center, though it did not specify how many beds were allocated to each area. It is difficult to know how many of the 1,500 total beds, or 500 Orient Organ Transplant Center beds, were used for organ transplants in 2012 and 2013. But there is a consistency in the reported utilization rates: 90 percent utilization reported in 2009, and 130 percent for 2013. Whether that ratio plummeted for four years before soaring—or slowly grew, as the trend of official transplant numbers (though clearly manipulated) indicate—is impossible to tell, though a steady increase seems most intuitive and internally consistent. Yet more construction took place in 2015 at a newly opened site, including an outpatient service able to process between 6,000 to 7,000 people per day, an emergency center able to process 1,200 daily, an underground carpark able to hold 2,000 vehicles, and a helipad. The new construction, which began in July 2015 and was scheduled for completion at the end of 2017, will have a total of 2,000 beds. It is unclear how many of them will be devoted to transplants. What numbers emerge from this kaleidoscope of activity? The hospital would have us believe that when their new transplant center came online, giving them hundreds of additional beds and much more sophisticated facilities, there was no increase in the transplant rate. The only official data for the post-2006 period is a figure of 5,000 cumulative transplants in 2010, and 14,000 in 2014—a neat, linear increase. But the facts paint a different picture: anecdotal reports from Korean organ recipients say that occupancy was far more than the hospital could handle; building records showing the need for continued expansion after 2006; and impressive staff resumes showing thousands of transplants from a few of the over 100 doctors. With utilization of the 500 beds at Oriental Organ Transplant Center near or above capacity from 2007 to end of 2013, the total number of transplants could range anywhere from around 20,000 to around 60,000, depending on the length of stay of patients. Only very rough estimates are possible given the many unknowns. This is far higher than the claimed cumulative total of 10,000 liver transplants over 15 years reported in official sources. That number already presents an awkward dilemma to explain away—but the numbers based simply on bed utilization rates are far higher than any known source of organs is able to explain. Of course, there is no way to know whether in its building renovation documents hospital staff are simply lying. But it’s unclear what incentive the hospital would have for fabricating the data on its renovation plans, submitted to a national database years after the funds had been committed, and the construction completed, by municipal authorities. Floor space or numbers of beds are tangible infrastructure that cannot easily be falsified, and bed occupancy ratios, from two separate official sources, show the same upward trajectory of high-usage from late 2006 until end 2013. There are many caveats to these estimates, however, including the fact that the number of executions implied by the bed occupancy rates is not clear. The ratio is likely not 1:1, given that the donation of a single kidney, to a relative, for instance, is neither fatal nor unethical. Tianjin First certainly engaged in this form of transplant activity. Further, one death can yield multiple transplant organs. At the same time, Chinese media reports contain anecdotes of Shen Zhongyang going through several livers—each bringing death even as it carried potential life—for a single patient. Given the multiple variables and vast unknowns, it would be foolhardy to suggest a firm estimate for the number of executions that may have taken place to fuel the business of Tianjin First. But whatever the figure, the implications are the same: the need for a mysterious, unknown organ source. So, where did the organs come from? China’s only serious source of organs through these years is, according to the official explanation, executed prisoners. The number of executions in China is a state secret and no numbers are provided, but estimates have long been made by third party organizations. Those vary from 12,000 to 2,400 per year during the period in question, according to Duihua, a U.S.-based human rights organization focused on China. If the nationwide death penalty was 6,000, for the purpose of our analysis, the number of executions taking place in Tianjin would be about 42 (given a population of about 7 million and a proportional distribution of executions.) If the number of executions nationwide was 5,000, there would only be 35 executions in Tianjin. But many prisoners are not eligible organ donors because of blood diseases, drug addiction, age, and other disqualifying maladies. Procedures around executions involve the local courts and prisons, which have their own relationships with hospitals and doctors, as indicated by abundant testimony from Chinese officials and defectors. The fief-like nature of the Chinese bureaucracy means it’s not as though Tianjin First could have its pick from any execution taking place anywhere in China. In particular, Tianjin First’s build-up was not an isolated phenomenon: dozens, if not hundreds of other transplant hospitals in China were establishing training programs for surgeons, building new facilities, and promoting their ability to deliver fresh organs to recipients in short order—weeks, or months at most. In 2014 Xinhua, the state mouthpiece, reported that in past years there were 600 hospitals in China, vying and contending for organ sources. All of those transplant centers needed organs, too. And then there are the unnerving advertisements on the hospital’s website, which have since been taken down. “It is true that the source of organ supply are fairly abundant in China compared with that in western countries,” an archived page on the site says blithely in 2008, in English, obviously targeting foreign transplant tourists. The website’s landing page in Chinese, on the other hand, advertised a waiting time of two weeks. This rapid matching from what appears to be a pool of prematched donors is consistent both with the use of death row prisoners, and harvesting from prisoners of conscience. But when it comes to volume, death row prisoners simply could not sustain the kind of supply Tianjin needed. Of course, by itself this is positive proof of nothing—except that the organs had to come from somewhere else. Recognizing this is the critical first step in any further exploration of the problem: if the organs aren’t from volunteer donors or executed criminals, then they must be coming from somewhere else. “Anyone who is even remotely familiar with the trends of organ donations worldwide cannot accept the claims of miraculously replacing a huge and well established organ source from executed prisoners within a single year by voluntarily donated organs,” said Dr. Jacob Lavee, the president of the Israel Transplantation Society and director of the heart transplantation unit at Tel Aviv University’s medical center, in an email. Into that breach come researchers who have raised allegations of a hidden and largely overlooked mass murder. Coupled with volumes of other evidence, they describe a crime against humanity in which the doctors stand alongside the murderers; the cause of death is the surgery itself, as organs are drained of blood and pumped with cold preservative chemicals. There’s a potential clue about the organ source in one of the many hats that Dr. Shen Zhongyang is found wearing: he appears on the website of the Beijing Armed Police Forces General Hospital, where he serves as director of the organ transplantation department, in full paramilitary regalia. The People’s Armed Police are a domestic standing army of 1.2 million, deployed around the country and mobilized to suppress riots. The most fundamental obstacle in performing large numbers of organ transplants is a donor source. Given that China had no voluntary, open transplant system, political connections, often mediated through brokers, have been the only way to get bodies. As Huang Jiefu himself remarked in an interview in early 2015: “Our country is very big. This source of using prisoner organs, this kind of situation naturally would come to have all kinds of murky and difficult problems in it. You know what I’m trying to say? It became filthy. It became murky and intractable. It became an extremely sensitive, extremely complicated area, basically a forbidden area.” He then went on to blame the abuse of organ transplantation in China on Zhou Yongkang, the deposed former security czar. Prisoners of conscience, of course, never came up. Theories about how Tianjin First Central turned on the organ spigot thus revolve around its political ties, including that of Shen Zhongyang, who became a member of the Communist Party’s faux advisory body, the Chinese People’s Political and Consultative Conference, in 2013. Shen is also a member of the standing committee of the Chinese Peasants’ and Workers’ Democratic Party, one of the eight legal political parties in China that give a window dressing of democracy while stiffly following the Party line. But it’s his paramilitary title that is most significant for organ sourcing, given that military and paramilitary hospitals are plugged into the security apparatus that hold hundreds of thousands of political prisoners, and are believed to be involved in much of the illegal trafficking in human organs. A handful of investigators have been tracking the military-organ nexus for years. In his 2014 book “The Slaughter: Mass Killings, Organ Harvesting, and China’s Secret Solution to Its Dissident Problem,” American journalist Ethan Gutmann marshals a mass of evidence, collected over nearly a decade, to show that practitioners of Falun Gong, a traditional spiritual discipline, have been primary targets for organ harvesting. Falun Gong, a practice of self-cultivation which involves exercises and moral teachings, has been persecuted in China since 1999, after the Party leader at the time, Jiang Zemin, declared it a challenge to Party rule. By the late 1990s, the number of people practicing it seemed to exceed the membership of the Communist Party. Hundreds of hospitals around China, like Tianjin First, all saw a dramatic spike in organ transplants in 2000, the year after the persecution began in July 1999. Gutmann, asked what he thought the likely source of Tianjin’s organs was in a telephone interview, said: “I think the majority of these organs are being sourced from Falun Gong.” He added: “There has been a large resident population of Falun Gong, of between half a million to a million at any given time within the laogai system through this entire period,” using the Chinese term that refers to the system of labor camps. Gutmann’s interviews of hundreds of refugees found that one in five, and sometimes two in five, Falun Gong detainees were subject to blood testing while in captivity. Those released from labor camps also describe disappearances of those tested. In covertly recorded telephone calls with overseas investigators since 2006, doctors and nurses in China, believing they are speaking to a fellow doctor or the relative of an individual in urgent need of a new liver, have acknowledged that they source their organs from Falun Gong prisoners. As in prisons and labor camps around the country, there are anecdotal reports of prisoners of conscience in Tianjin being singled out for blood and urine tests during the period in which Tianjin First Central was at its peak of operations. These accounts are drawn from Minghui.org, a clearinghouse of first-hand information about Falun Gong in China. Articles on the site are typically submitted by practitioners of Falun Gong, friends, or family members, often documenting their experiences under persecution. The site is widely used by by academics and human rights researchers studying the practice or its repression, and is considered a reliable source for insight into the Falun Gong community in China. A simple search across Minghui.org for the terms “blood test” and “Tianjin” reveals 9,720 results. Many of these are likely duplicates or do not refer to personal experiences of blood test at Tianjin, but a large number appear to do so. A typical case, submitted on Nov. 9, 2007, is titled “The persecution I witnessed and experienced at the Tianjin Women’s Prison.” Like many submissions on Minghui, the report is anonymous, for obvious reasons. It says: “The Third Squadron in the prison specifically targeted Falun Gong… the squadron leader of every Third Squadron in each section of the jail called out the Falun Gong practitioners one by one, and gave them blood and urine tests. They didn’t call out criminal prisoners. The squadron leader said it was because they wanted to look after the Falun Gong prisoners.” The prison is a little over 30 minutes away from the hospital. Other cases of blood tests are reported at the Qingbowa Re-education Through Labor camp. Qingbowa is a 23 minute drive from Tianjin First. The Shuangkou Re-education Through Labor is another camp in which, according to reports on Minghui, Falun Gong practitioners report having their blood tested while in detention. Shuangkou is also about a 30 minute drive from Tianjin First. Falun Gong practitioner Hua Lianyou reports having her blood taken in June 2013 in the Binhai Prison, which is about 45 minutes from Tianjin First. Xu Haitang, a practitioner of Falun Gong, reports having her blood drawn in June 2006 at the Banqiao Women’s Labor Camp, which is about 90 minutes away. Of course, none of this is proof that the blood tests were for the purpose of blood matching for organ transplant. But it is also true that the actual reason for blood and urine tests is unclear, and even confusing: the incarcerated individuals are, after all, in prison due to a campaign, led from the highest levels of the Communist Party, to eradicate their belief system. They are typically subject to torture, electric shocks, and beatings in detention, in an attempt to have them renounce their beliefs. Falun Gong had been slandered in the state press, and adherents to it incited against, dehumanized, mocked, and declared to be enemies of the state. Thousands of deaths from torture have been reported, and no investigation or punishment takes place because of the state-sanctioned nature of the campaign. So why would prison officials be extracting blood for the benefit of the captives? It’s this context that has led analysts to believe that the blood tests and disappearances in captivity of Falun Gong practitioners, along with the transplant boom that took place soon after the persecution began, are most likely explained by mass organ harvesting. Even if the international medical community wished to refrain from concluding preemptively on a massive crime against humanity, one might expect at least a demand for further attention and investigation into just where the organs are coming from, and the extent to which prisoners of conscience have been targeted. It would, after all, constitute one of the most disturbing mass crimes of the 21st century. Some countries, including Israel and Taiwan, have adopted legislation aimed at preventing their citizens traveling to China to receive organs, after the reports of harvesting from Falun Gong emerged. All this makes the reaction of some of the key players in the international transplant scene—the kind of individuals whose imprimatur would lend sufficient public heft to the allegations as to prompt broader international censure and calls for investigation—all the more jarring. They have been uncurious about the question of crimes against humanity, adopting instead a complaisant stance, part of Kissingerian-styled bid to help the project of China’s organ transplant reform. Dr. Francis Delmonico, the former head of The Transplantation Society and previously the key international liaison with China on transplant issues, wrote in an email: “My only comment is to encourage the assessment of the Tianjin First Central Hospital to report verifiable data.” The word “only” had been put in bold. The current head of the The Transplantation Society, Dr. Philip O’Connell, and the World Health Organization’s liaison to China on organ transplant issues, Dr. Jose Nuñez, did not respond to emails. TheWHO’s Guiding Principles on organ transplantation require that the entire organ transplantation process be transparent and open to scrutiny—yet WHO officials have done little to make such public demands on China.